Click on the website below. Play with the different ways to make waves. Use all the different tools and determine how they affect the wave. (damping, pulse width, amplitude, manual, oscillate, etc. Write a paragraph (minimum of 5 sentences) about the activity. Click on the website below. Describe the particle movement for each of the types of waves. Click on the website below. What types of waves are transverse? Click on the website below. What types of waves are longitudinal? Click on the link below. Watch the clip. Write a paragraph (minimum of 5 sentences) about the clip. 1. 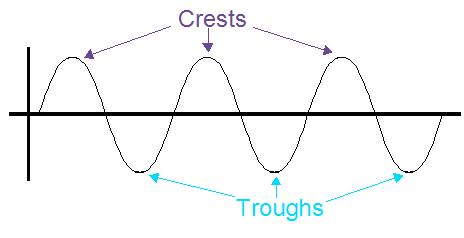 Copy into notebook: "Wave--rhythmic disturbance that carries energy but not matter"
- Click on the crests& troughs picture and draw this diagram in your notebook. - Go to the frequency animation, and play around with it. - Use what you see to write your own definition of frequency in your notebook, which can include diagrams. - Go to the amplitude and wavelength animation, and play around with it. - Use what you see to write your own definition of amplitude in your notebook, which can include diagrams. - Use what you see to write your own definition of wavelength in your notebook, which can include diagrams. and watch the animations of compressional and transverse waves. Using a complete sentence, list one thing that is similar between compressional (a.k.a. longitudinal) and transverse waves. - Using a complete sentence, list one difference between compressional (a.k.a. longitudinal) and transverse waves. - Go to the red dot page, and use it to answer # 8 and #10. Notice that you can click between transverse and longitudinal. - Start the animation for the transverse wave. Carefully watch the red dot. To the diagram you already drew, add a short line with arrows on both sides that shows the movement of the red dot. direction of the wave. Example: water waves "
- Start the animation for the longitudinal wave (you have to click the button to change it). Carefully watch the red dot. To the diagram you already drew, add a short line with arrows on both sides that shows the movement of the red dot. of the wave. Example: sound waves "
- Go the the earthquake wave website, and play the animations. - Answer in a complete sentence: What type of wave is a P-wave (transverse or compressional)? - Answer in a complete sentence: What type of wave is an S-wave (transverse or compressional)?